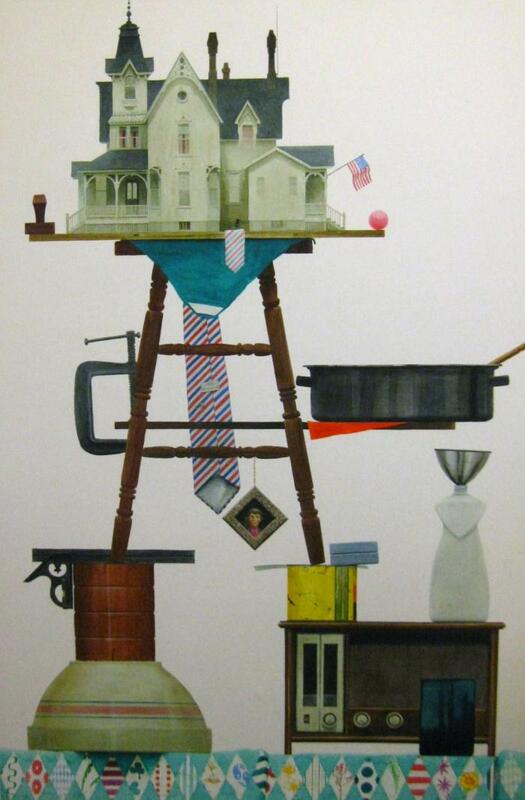 A white house has been placed on a stool which is supported by a radio and an upside down bowl. Mike McDonnell was born in Muskegon, Michigan, in 1937. From 1956 to 1958 he studied with W.H. Mosby at the American Academy of Art in Chicago. He continued his classes from 1958 to 1960 with Sidney E. Dickinson at the Art Students League of New York. In 1959 he also completed a year of study at the National Academy School of Fine Arts in New York with Robert Phillip and Dean Cornwell. He received additional training in portraiture, initially in oil. In his later works he strived to idealize his everyday subjects while emphasizing clean, precise colors and details. This painting demonstrates the artist's mastery of a medium, as well as, provides an insight into his sense of humor.